Basic meat loaf gets a flavor boost with McCormick® Worcestershire Ground Black Pepper Blend. 1. Preheat oven to 375°F. Heat oil in small skillet on medium heat. Add onion; cook and stir 3 minutes or until softened. Cool slightly. Mix seasoned salt, 1 1/2 teaspoons of the Worcestershire Pepper and thyme in small bowl. 2. Mix ground beef, bread crumbs, cooked onion, milk, eggs and seasoning mixture in large bowl. Shape into a loaf on foil-lined 15x10x1-inch baking pan. 3. Bake 55 minutes. Mix ketchup, brown sugar and remaining 1/2 teaspoon Worcestershire Pepper. 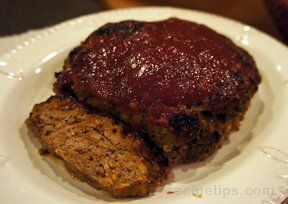 Spread over meat loaf. Bake 5 to 10 minutes longer or until meat loaf is cooked through. Let stand 10 minutes before serving.